Having already watched the first four series of Absolutely Fabulous on video, as well as the extras that came with the DVD versions of same, I have now finally caught up with the fifth series and various specials. Hurrah! 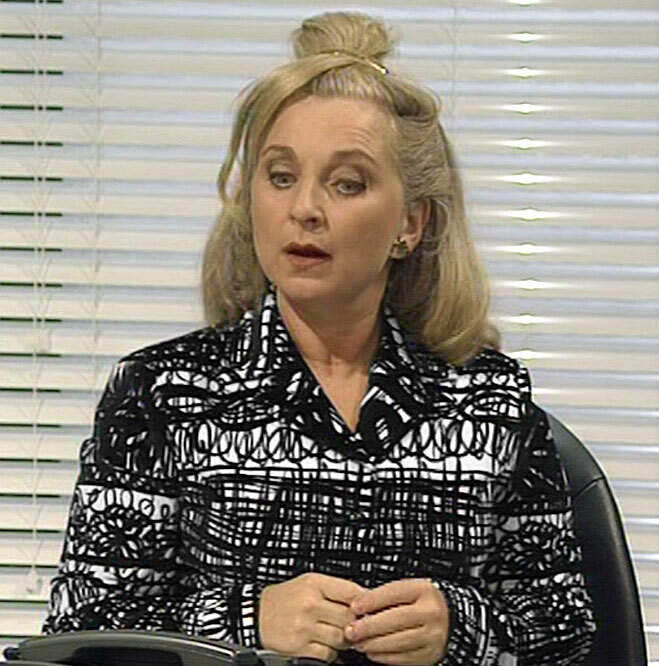 As the title suggests, Jennifer Saunders was suffering from AbFab-fatigue at the time, and intended this feature length special to be the end of the story. In hindsight it would have made for a rather lacklustre send-off, since Jane Horrocks (aka ‘Bubble’) had gone AWOL, and been replaced by the very-lovely-but-nowhere-near-bizarre-enough Helen Lederer as ‘Catriona’. Still, the main plot is pretty intriguing, with ‘Saffy’ (Julia Sawalha) announcing her impending marriage to her oppressive, snobby beau ‘Paolo’, played by a very young (and occasionally shirtless) Tom Hollander. The coupling doesn’t really do Saffy any favours as a character, and it’s sad to see her playing the submissive wifey whenever he’s around, rather than the raging “voice of reason” we’re more familiar with… but it does make for a novel shift in the domestic dynamic, if only for an hour or two. Personally, I thought the payoff to the story was a bit of a damp squib, and should have been played a little larger (I’d have had ‘Eddy’ rugby-tackle the vicar and knock him unconscious), but overall it was a fairly enjoyable instalment, with some gorgeous alpine scenery in the first half… I’m just glad it wasn’t all she wrote. Oh, and the MVP award here has to go to Mo Gaffney (aka ‘Bo’), who steals numerous scenes while hiding out in Eddy’s kitchen, seeking sanctuary from the Scientologists. For this one-hour special, Eddy hops across the channel to track down her errant son, the oft-mentioned but previously unseen ‘Serge’. According to a business card she steals from Saffy’s diary, he’s supposedly working at an LGBT drop-in centre, where Eddy and Patsy (Joanna Lumley) blackmail a counsellor (played by Whoopi Goldberg) into giving up more info on Serge’s whereabouts. Again, the payoff to this epic quest is a bit of a let-down, but there are some very funny scenes along the way, and a couple of gratuitous, crowbar cameos… including Rufus Wainwright and Deborah “Debbie” Harry (who is also heard several times on the soundtrack and contributes a brand new version of the series theme song). Highlights for me included Eddy training Bubble like a misbehaving dog, and the clips from Bo’s bizarre televangelist show (which also featured Horrocks as a new character called ‘Lola’). Basically, the crazier this show gets, the harder I laugh. It’s also interesting to see Saffy getting a little jealous of Serge, with Mother (June Whitfield) questioning what her granddaughter would actually do without Eddy around to berate. It’s suggested on the commentary track that there were about twenty minutes of material cut from the show, but sadly they didn’t bother including any of it on the DVD. 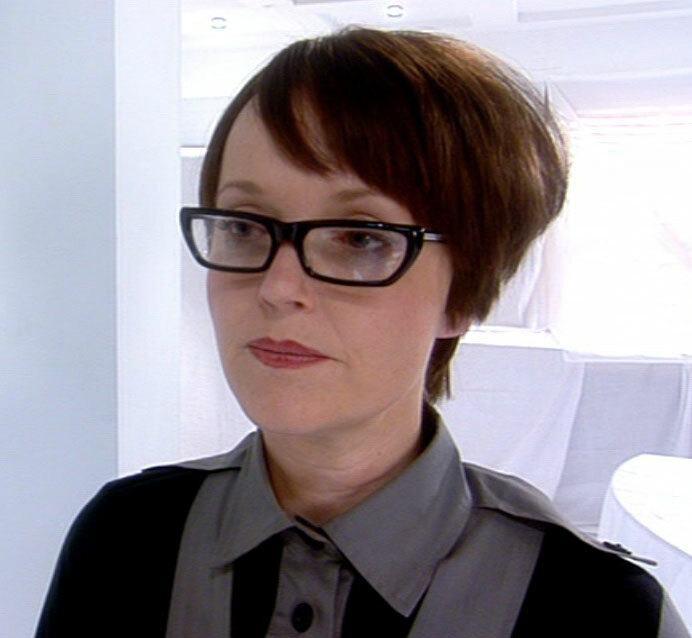 Over a decade after it first stumbled drunkenly onto the air, AbFab was still going strong in the new Millennium, with a fifth series of eight episodes… although Saunders was also accepting “additional material” from comedienne-turned-cookery-show-presenter Sue Perkins, according to the end credits. This run also saw a pretty dramatic development on the home front, with Saffy announcing that she’s pregnant at the end of the first episode, thus spawning (pun!) a fresh batch of plots for subsequent instalments. I didn’t think the “baby-daddy” was a particularly strong character, but I did like the way Eddy started wearing more “urban” clothes as soon as she discovered that her grandchild would be mixed-race. Never slow to hop on a trend, is she? The series ended with an unseasonably dark Xmas episode, in which a character was killed with an involuntary heroin overdose, but somehow, they still manage to end on a joke! Apparently the American edition of the DVD excised a dream sequence from ep #5.5, in which Horrocks, Gaffney, and Chris Ryan performed a musical number from Chicago, which is a shame because it was one of the highlights of this series for me. There were also a couple of fun cameos to enjoy here: Ep #5.2 featured Jeanette Krankie as a brilliantly brash Midwife… plus an admirably intense Kristin Scott Thomas as a member of Eddy’s book club named ‘Plum’. I’m not quite sure what her character’s angle was, but I loved her outfit! Minnie Driver appeared as a grasping parody of herself in Ep #5.3… Jean-Paul Gaultier (who most people probably think of as a fancy fashion designer, but I’ll always think of as the co-presenter of EuroTrash) had a brief cameo as himself in ep #5.7… and Eleanor Bron returned as Patsy’s monstrous mother, in ep #5.8. Hurrah! In stark contrast to the previous specials, with their exotic locations and momentous, soapy plots, this one tells a very small, confined story, punctuated by fits of extreme strangeness. With Saffy away in Africa getting hitched to her baby-daddy, Eddy decides to remodel the kitchen with the help of her old chum, ‘Bettina’, played by the marvellous Miranda Richardson. Unfortunately, the woman is barking mad, and decides to remove all of the appliances (and even the staircase!) in order to create a perfect, minimalist space. The race is then on to fill the room up again, before Saffy blows her top. In her quest for a new kitchen Eddy visits an eccentric (but relatively sane) interior designer played by Nathan Lane, whose mono-browed assistant ‘Yoko’ is played by Miranda Hart… and she also employs the services of a regression therapist, played by Laurie Metcalf, to help her dredge up some inspiration. Often more “funny peculiar” than “funny ha-ha”, with some rather unsettling jokes about Patsy’s medical woes, I think this chapter still proves that there’s a lot of juice left in the series yet… so I’m definitely looking forward to seeing what Saunders has in store for her anti-heroines next! This entry was posted in Rants about TV and tagged Ab Fab, AbFab, Absolutely Fabulous, Debbie Harry, Deborah Harry, Eleanor Bron, Gay, Helen Lederer, Jane Horrocks, Jeanette Krankie, Jennifer Saunders, Joanna Lumley, Julia Sawalha, June Whitfield, Kristin Scott Thomas, Laurie Metcalf, Minnie Driver, Miranda Hart, Miranda Richardson, Mo Gaffney, Sue Perkins, The Last Shout, White Box, Whoopi Goldberg. Bookmark the permalink.